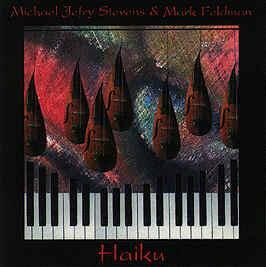 Michael Jefry Stevens, piano; Mark Feldman, violin. Keen Tyler (02.54), Sunset Park (07.27), Lilliputian (04.38), Ballad of habit (05.23), In front of the myth (06.24), Kashf (06.36), 12 Chatham Road (04.23), The fourth guy (09.51), Kerney (07.45), Nocturne (06.15). Recorded on 13 April 1995 at Seltzer Sound, NYC. Original artwork, cover design and layout (reproduced above) by David Hoffer.